CMX amplifiers incorporate everything QSC has learned in more than forty years of striving to deliver worry-free operations without failures. The design of these amplifiers starts with our world-class power supplies. The CMX uses a powerful, high-current toroidal transformer and filtering to ensure generous energy reserves. This allows the amplifiers to effortlessly handle high-level transients, even when driving abusive 2 ohm speaker loads. The CMX amplifiers deliver true and accurate studio-quality sound. A full complementary output circuit using high-grade linear output devices generates accurate, flat-frequency response with low distortion. SMT (Surface Mount Technology) triples small-signal component density, enabling high power output in a 2 rack unit chassis (3 RU for the CMX2000V). Unlike other designs, CMX output devices are directly mounted to the heat sink for optimum thermal coupling and cooling. The CMX Series is available in four models. Three 2-rackspace models range in power from 300 to 800 watts per channel at 4 ohms. 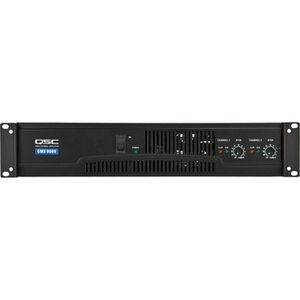 One 3-rackspace model provides 2500 watts per channel at 2 ohms. All four models feature a compact chassis less than 16" deep.